Apart from being a tongue twister of a name, this dish is an ideal combination of textures and flavors. 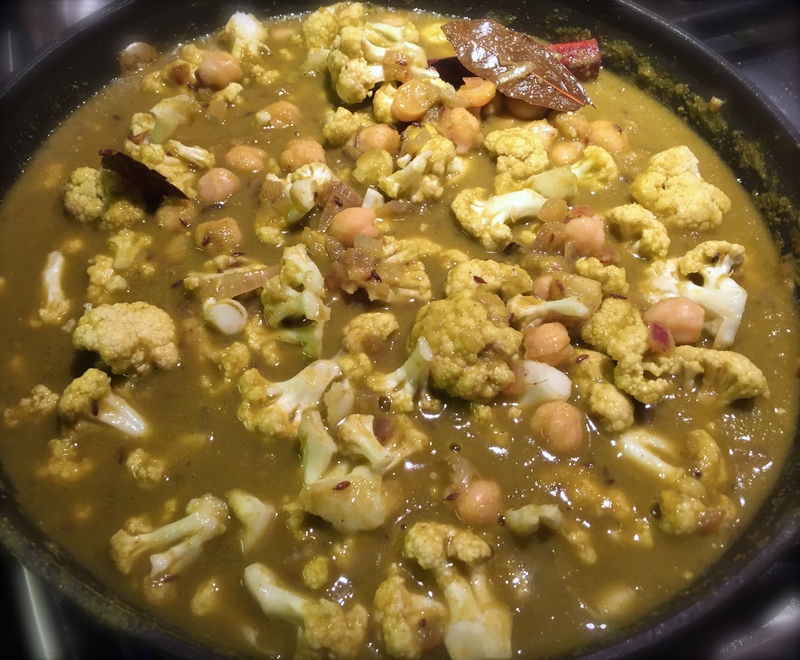 The aromatic cilantro with creamy coconut and warm spices make this a perfect “warm your belly” meal. Puree the cilantro, chillies, garlic, salt and tomato, a few pulses in a food processor or blender. Add the grated coconut, and few table spoons of water just to get to a pourable consistency. Blend this all together into a smooth puree and set aside. Heat oil over medium heat, and add the bayleaf and cinnamon. Once the oil is heated add the cumin seeds, followed by cumin, coriander, and turmeric powders. Fry for a couple of minutes. Add the chopped onions, and sauté for 4-5 minutes, until the onions have turned translucent and start slightly caramelizing. Drop the heat to low, and carefully pour in the blended coconut cilantro mixture. Watch out for splattering. Turn the heat to high, and bring the mixture to a boil. Remember to keep stirring for a minute. Drop the heat to low, and simmer for 12-15 minutes. 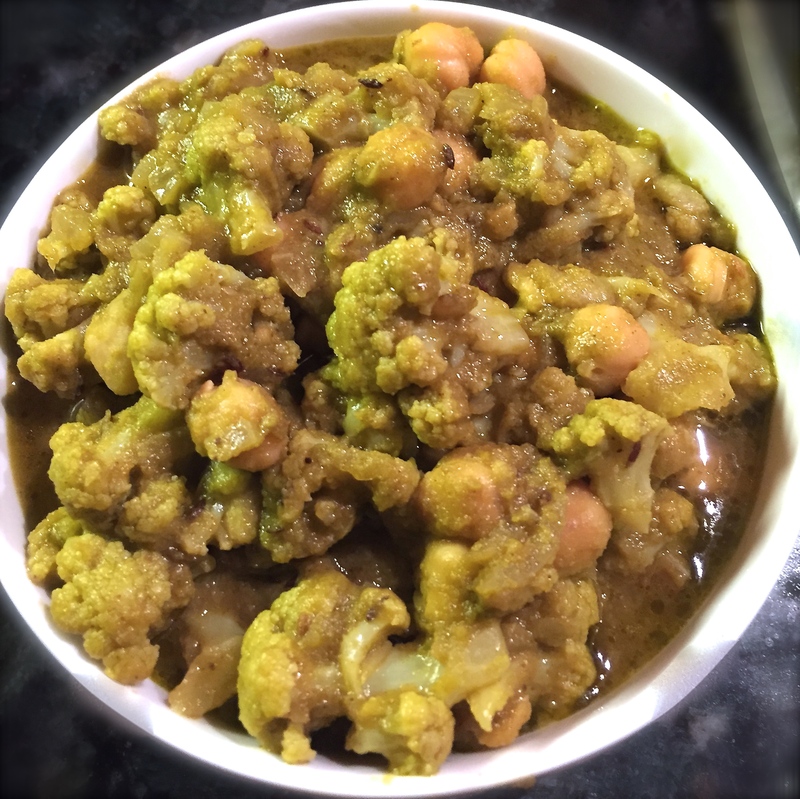 Add both cauliflower and chickpeas to the masala, with a tsp of salt, and mix well together. Continue to cook for another 15 minutes, until the cauliflower is cooked. It should still hold its shape and retains some bite. Finish off with a tbsp of ghee (this tsp is optional). The brown butter/ghee gives the whole dish a quick velvety sheen, and adds a great layer of nuttiness which works perfectly with the rest of the flavors. Serve with a carb of your choice – Chapati, Naan, a bowl of hot white rice, quinoa, or cracked wheat. Pick your carb, it doesn’t matter, cauliflower is the star!